I therefore feel the need to give an update on the work I started one year ago and hinted in the cartridge filesystem topic. 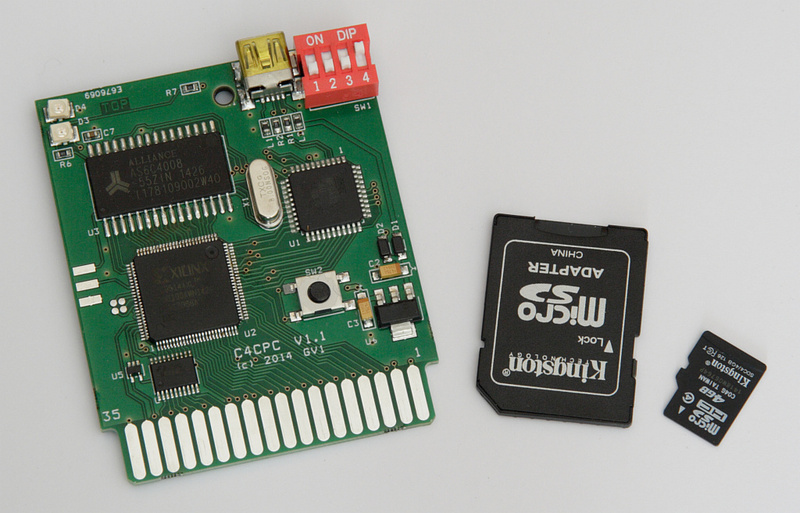 Form factor prototype, fitting in the original cartridge shell. Direct accessed to 16 cartridge image (.cpr) using dip switches. Images are stored on a micro SD card. A cartridge selector running on the CPC if you need more than 16 images. Loading of cartridge from PC using USB port. I am still taking reservation for the second batch. If you are interested in a card, just PM me. Second batch card price is not fixed yet, first batch cards were 60 euro. New price will be fixed according to component price (linked to dollar/euro parity) and number of cards reserved. 06/07/2015 : Vacation time . 2nd batch shipping will resume during last week of july with reservation done after the 10th of May. 8/8/2015 : All second batch people have contacted. 13/11/2016 : All cards have been sold. Awesome work done!!! I bet you had a lot of fun soldering all that SMD parts. So each of your Cartridge images can store 512 KB, right? That's pretty neat! Can you upload data from the CPC or do you need a PC? (You told about a cart selector, but I got no idea what this is). Does it run on real Cpc plus? The cart selector is a CPC side SW that allow you to browse the file on the SD card and load it. The SD is fully handler by the uC, the CPC only get the file list and control the uC. Well, I need to sort the "when" first. My biggest issue is manufacturing. Soldering 0.5mm pitch IC is ok for few pieces, not for a production. ....The cart selector is a CPC side SW that allow you to browse the file on the SD card and load it. The SD is fully handler by the uC, the CPC only get the file list and control the uC. Oh well, that's not a big problem. I mean how often does one need to update the content of the SD-Cart? Maybe once a year? Of course such a Cartridge will motivate people to do Cart software, but still it takes it's time. Well... maybe production isn't even necessary. Maybe there's not such a big demand. I mean, it's not like the topic has come up repeatedly multiple times within the last year with the exact same questions over and over again...... oh wait. Right. Hm... I'd say, a few devoted developers should be allowed to buy one of the manually soldered ones, to boost their CPC cartridge-game development urges. What do you reckon' the price for one of those will be, fully assembled? It's down to the batch quantity, but I hope to keep it below 80 euros for small quantity batch (without casing). How do you make this cartridge working without acid rom? Take one for sure..... Just to know, How will it cost ? I've tested all CPR available. While I did not played all the games, I did not get any problem so far. Can you give us an idea of price ? and when I get back we've got this fantastic cart. Well, I would be interested too. Would speed up my game development. As Gerald told, about 80 Euros. Which makes sense. However one can always expect some change, depends on prices for parts. IMHO that's really worth. Are you taking pre-orders? Is that what you're doing? Putting together a list of people who has pre-ordered the device? If so, make sure my name is on that list too. Page created in 0.286 seconds with 105 queries.